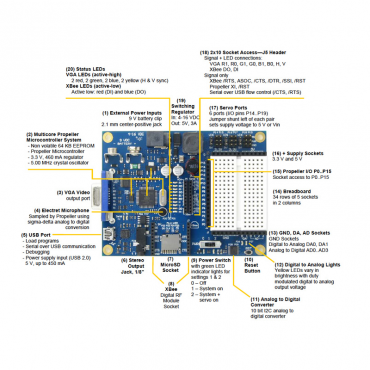 Propeller Board of Education Product Guide. Propeller Board of Education Schematic. Propeller Board of Education Bill of Material. 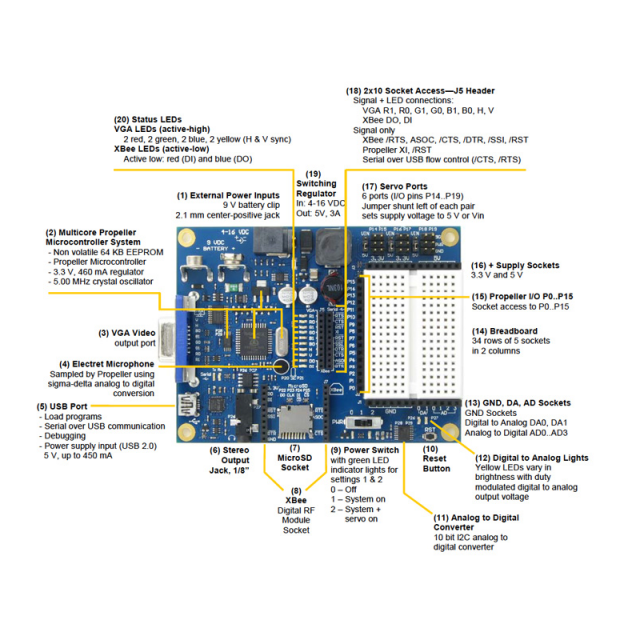 Propeller Board of Education Design Files. Propeller Board of Education Additional Resources. 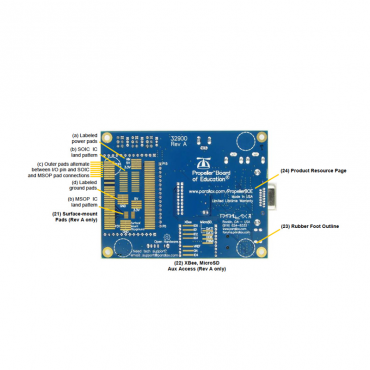 The form of the original Board of Education meets the powerful function of the multicore Propeller microcontroller. A built-in set of peripherals makes it ready to support an amazing array of projects, prototypes, hands-on activities, and kits. 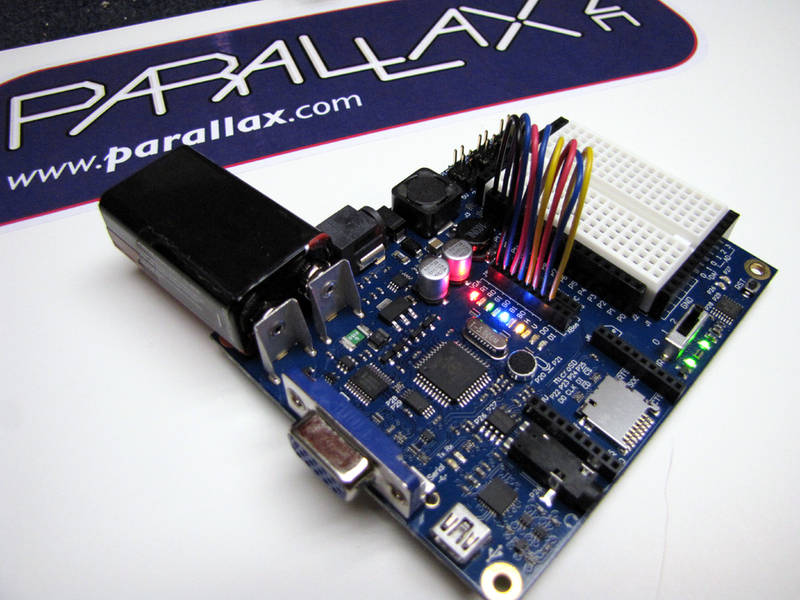 The Propeller Board of Education is ideal for learning the basics of electronics, programming and robotics. It also simplifies advanced applications that require RF-linked communication, audio/ visual peripherals, and gigs of SD memory. Built-in Propeller microcontroller, 64 KB EEPROM and 5 MHz crystal oscillator. Breadboard, sockets for power and I/O access, and six servo ports with power-select jumpers for easy prototyping. Automatically selects between USB and external power sources and provides USB over-current protection. 9 V battery and center-positive 2.1 mm power connectors offer two external power options. Convenient reset button and 3-position power switch. Onboard Mini stereo-audio jack, electret microphone, and VGA port for audio/visual projects. 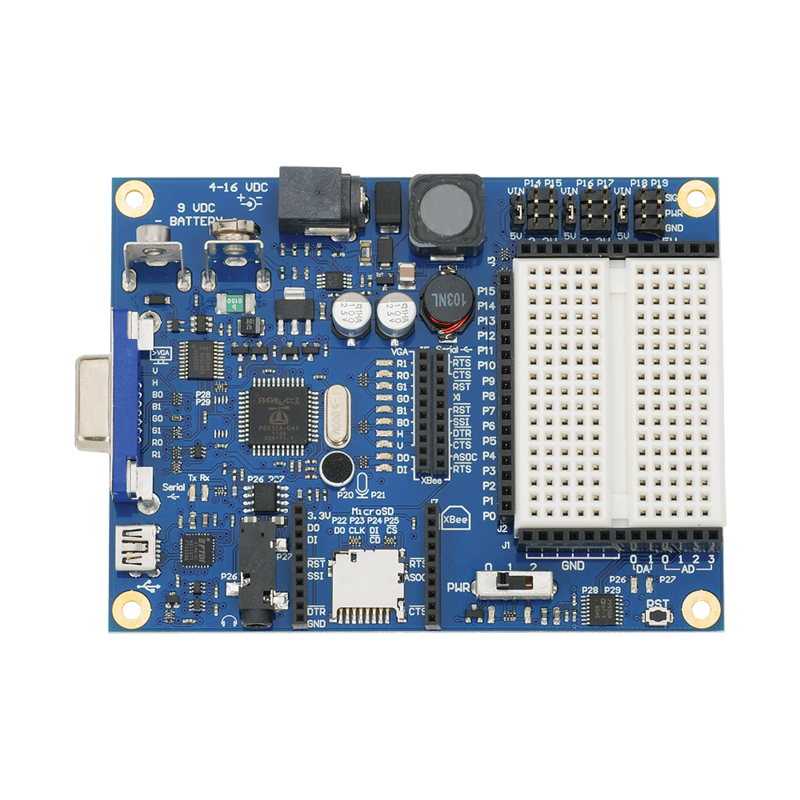 Built-in MicroSD card and XBee wireless module sockets simplify advanced applications. Dedicated analog header sockets provide three 10-bit inputs and two buffered variable-resolution outputs. 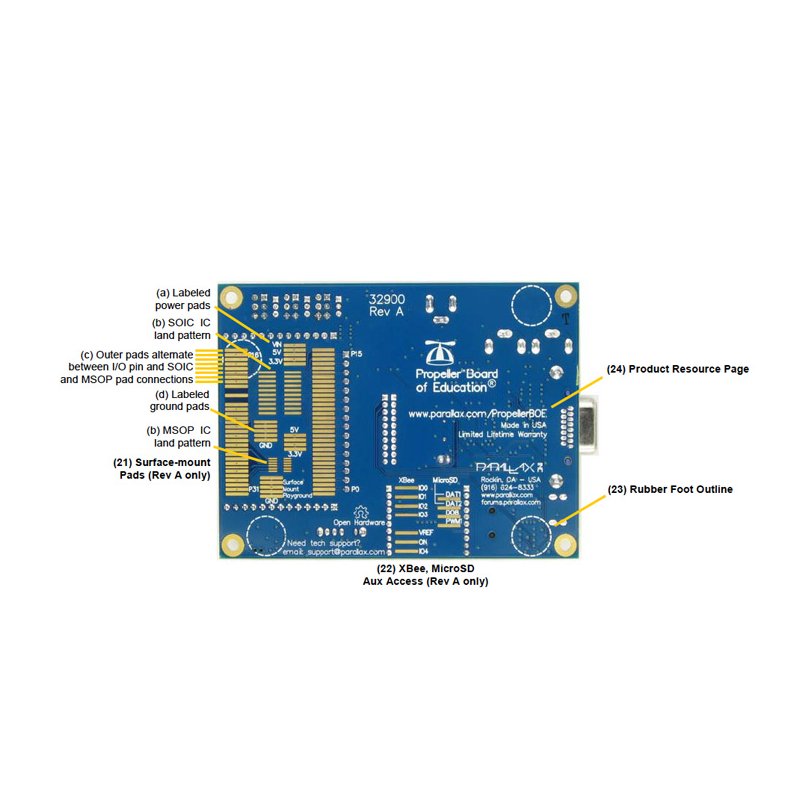 2x20 header for connecting I/O pins to VGA, XBee, Propeller clock and reset, USB serial flow control, and up to 10 LEDs. Indicator lights for system power, servo power, eight color-coded VGA channels, two analog output level, XBee TX/RX, and USB TX/RX. SEPIC 5 V switching regulator can deliver up to 3 A across the commercial temperature range. Linear 3.3 V regulator can deliver up to 460 mA at room temperature. Dimensions: 4.375 x 3.05 x 0.625 in (11.11 x 7.75 x 1.59 cm). 7.5 VDC 1 Amp Power Supply. NOTES: The Propeller BOE is designed and manufactured in Rocklin, California using precision equipment, a skilled and caring team with the highest quality components. To back our commitment to this high-quality product, Parallax provides a Lifetime Warranty on your Propeller BOE for as long as we manufacture the product.